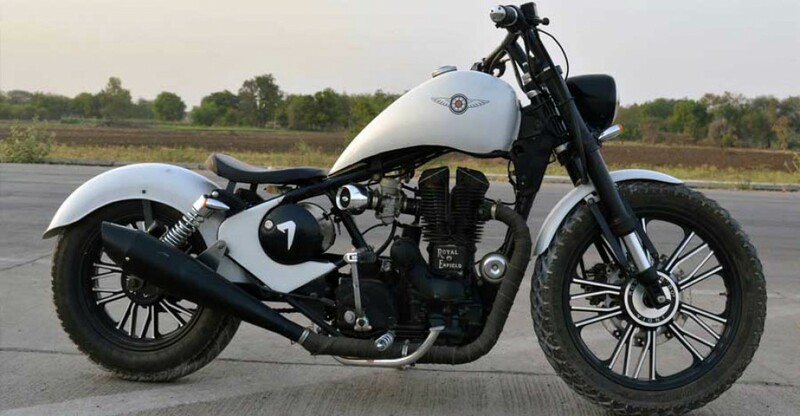 Royal Enfield Thunderbird is one of the most popular bikes among customization shops as we have already seen so many Thunderbird modified to look like scrambler, etc. Pixain Customs is a modification shop based in Neemuch, which is a small town in Malwa region in the state of Madhya Pradesh. The custom shop has given chopper series design theme for the modified bike as they have changed most of the body parts. The front gets upside down forks instead of stock telescopic suspension and Pixain Customs has given new front fender. The stock headlamp has been replaced by aftermarket unit with LED lamps. The custom Chopper comes with new small LED indicators, which are placed below headlamp. The stock handlebar is replaced by new wide handlebar, which is placed higher on the body. Pixain Customs uses new fuel tank, enabling a muscular look for the Chopper and the rider seat is positioned lower on the body. The foot pegs are forward set along with wider handle bars and low seat gives a comfortable riding position as it is specially designed for the customer. Pixain Custom increased wheelbase of Thunderbird as they have given new rear fender along with twin rear shocks, which is tuned for comfort. The rear gets small tail lamp along with number plate, which is positioned on the left side but the custom shop skipped instrument cluster. The body panels of this custom chopper are finished in white colour and mechanical parts in black colour. The stock wheels have been replaced by new aftermarket wheels in which front is bigger compared to wider rear tyres. Pixain Customs hasn’t revealed details about engine modifications as whether it is 350 or 500 cc with improved power out or not. The stock exhaust system has been replaced by a new aftermarket unit, which is finished in black colour. The custom shop hasn’t revealed details about pricing and time taken to complete this modification.